At the end of 2004 NVIDIA and Intel signed an agreement on cross licensing, which made it possible for nForce chipsets to support Intel Pentium 4 processors. 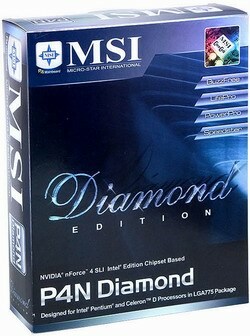 nForce 4 SLI Intel Edition has become the first such core logic. 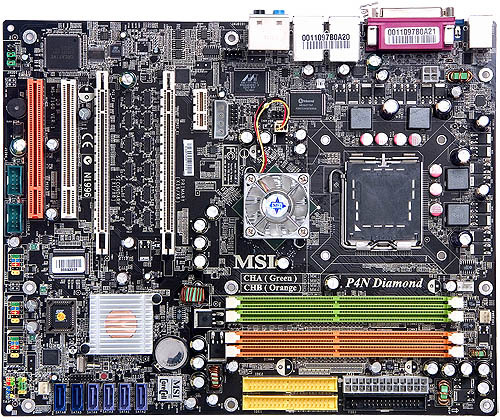 And MSI P4N Diamond has become the first such production-line motherboard on the new chipset that we tested. It goes without saying that the key feature of nForce4 SLI (IE) motherboards is the SLI technology, which has been used for quite a long time in top models of motherboards for AMD Athlon processors 64/FX. Note that MSI P4N Diamond supports software (in BIOS) switching between a single-card mode and SLI. Most competing solutions allow only manual switching with the help of a special board. However, this functionality does not free additional space on the PCB (it's rather on the contrary) — the gap between PCIEx16 slots is occupied by the switching unit. Another feature of the new motherboard (not as evident as the two PCIEx16 slots :)) is a sterling audio controller from Creative (CA0106-DAT chip). That's right! This controller is used in Creative Sound Blaster Live! 24-bit and Creative Audigy LS, it offers hardware support for 7.1 audio, 24 bit/96 kHz, EAX 3.0, Surround Sound and Dolby Digital EX. Moreover, the board uses the same top ADC and DAC (ADC — Wolfson WM8775, DAC — Cirrus Logic CS4382) as in Sound Blaster Live! 24-bit. That is, this motherboard is actually equipped with an excellent sound card (accurate to the number of ins and outs)! I would also like to mention such functions as an external hard drive connection (e-)SATA, two gigabit controllers and Dual Net Card to implement two radio interfaces: Bluetooth è WiFi-g (802.11g). 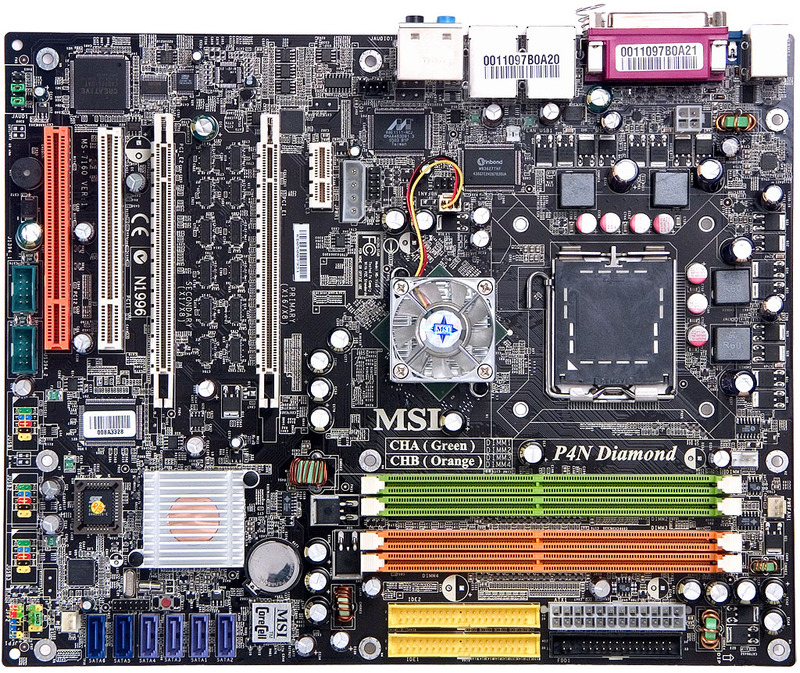 No wonder that such suffix as Platinum (or, perish the thought, shabby Gold) is not enough for this motherboard: MSI calls this motherboard a diamond model. Taking into account the initial estimated price of about 250—300 USD (probably only for the basic bundle! ), this hint does not go unnoticed. The only unusual thing about the PCB layout is the two graphics slots and an empty space between them. On-board elements certainly have to squash up due to the rich functions of the motherboard: connectors for additional USB and FireWire port are located at the bottom edge (it's hard to access these ports when a motherboard is installed into a chassis) you will have to manage memory modules through a jungle of cables; cables to the additional power connectors hang over a CPU cooler. Probably the only serious drawback is the location of the north bridge with a high cooler: even the heatsink of a standard (boxed) Pentium 4 cooler almost abuts on it, so you probably won't manage to install a wider heatsink on it. Heatsinks on both chipset bridges are almost scalding to a touch when operating, so active cooling of the north bridge and the copper disc in the heatsink base on the south bridge do not look excessive at all. But the contact between these two heatsinks and the chip surface is horrible: a thin layer of thermal paste on the north bridge, but the heatsink is loose, the cooler is slack; and the second heatsink is glued to the surface by a thick layer of thermal glue. The 4-phase switching voltage regulator of the processor incorporates four 3000 uF capacitors and eleven 1000 uF ones. The board also contains a voltage regulator for memory (twelve 1000 uF capacitors). The main regulator uses electrolytic capacitors from Sanyo and Rubycon (an excellent choice!). In this model MSI broke its good habit to cool field-effect transistors in the CPU power circuit with small heatsinks (probably due to the increased number of transistors per channel: 4 instead of usual 2—3). The board uses a convenient button instead of the standard jumper to clear CMOS. Access to it is not hampered even when the board is installed into a chassis. But a short description of its functionality is provided on a PCB. The board provides an empty seat for AC'97 codec Realtek ALC850: the documentation runs that it replaces the on-board Sound Blaster Live! 24-bit in some motherboard modifications (in this case the sound is processed by the CPU). It's a considerable deterioration of board's properties (though the support for 7.1 audio with software improvements on the driver-level is retained). Unfortunately, we cannot tell for sure what modifications exactly have a replaced audio controller, because MSI P4N Diamond remains the only motherboard on NVIDIA nForce4 SLI IE from this company (at the time of this review). But still, the PCB layout is probably unified for future cheaper models on the same chipset. 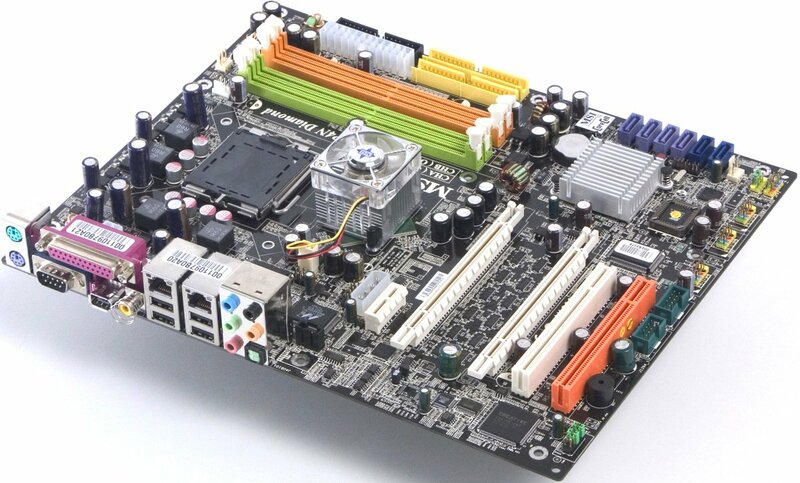 Motherboard dimensions — 305x245 mm (full-sized ATX, nine-screw mount, all motherboard edges are firmly fixed). 4 fan headers (two of them allow rpm control, they are used for the coolers on the CPU and the north bridge; the header for the CPU cooler supports automatic rpm control depending on CPU temperature — Smart Fan). The official MSI web site claims that the motherboard supports dual-core Pentium D and Pentium Extreme Edition processors. Meanwhile the supported CPU list for this model does not contain stability test results for such processors so far. The sample in our lab has worked perfectly well with the top Pentium Extreme Edition 840 processor at maximum load for several hours. But if you plan on purchasing a dual core processor, you'd better wait for the official certification from the manufacturer. 5 x Analog Audio (Mic-In, Line-In, Front, Center/Sub, Rear) and S/PDIF-OUT TosLink. 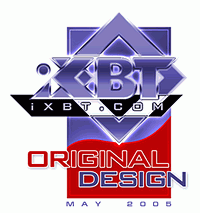 CD with drivers and utilities. FireWire based on the VIA VT6306 chip supporting 3 ports. General performance: Very good (details). It's only natural to compare the results obtained with those demonstrated by Creative Sound Blaster Live! 24-bit: the integrated audio in this MSI motherboard has a noticeably higher noise level (-90.8 dBA versus -96.9 dBA) and a narrower dynamic range (88.1 dBA versus 93.6 dBA). It's hard to put a finger on the reason, but the distance between the DAC and the analog outputs is larger in case of the integrated solution. Besides, a motherboard contains quite a few interference sources. D-Bracket 2 (a set of LEDs on a bracket that informs a user on startup problems). We used BIOS 1.0BK, the only available BIOS version at the time of our tests. The mentioned BIOS parameters are available in this version, but the viability of non-standard settings hasn't been tested. There is a boot menu function, which allows to select a device to boot from without modifying BIOS settings. As MSI P4N Diamond is the first production-line motherboard on nForce 4 SLI (IE), that we have tested in our lab, we cannot say for sure whether its performance is typical of chipset representatives. When other models appear, we shall compare them. What concerns now, we can publish a short comparison with the fastest, according to our tests, motherboard on a chipset, which has just gone from the top league — Gigabyte 8AENXP-D based on Intel 925XE. Note that the tests were carried out with a single video card, as the SLI performance will be reviewed in detail separately. We shall save up our conclusions for the soon-to-be roundup of modern chipsets for Intel processors with the fastest memory. But now we can note that the new motherboard is a tad faster than motherboards on the ex-top Intel chipset (925XE). We just have to wait a little to see whether motherboards on the latest i945/i955X chipsets will manage to reach higher performance. You may expect the reviews of other motherboards based on nForce4 SLI (IE), where we shall nominate the fastest representative of the chipset.